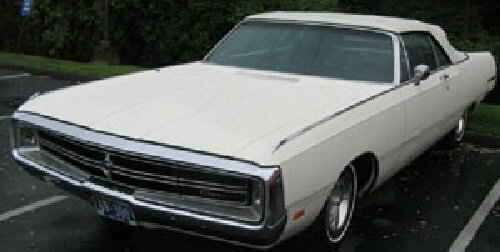 CHRYSLER 300 SERIES - (V-8) - The 300 Series had the same overall styling as lower priced Newports. The designation Three-Hundred was spelled out, with chrome block letters, on the rear quarter panels. A grille with a variation of traditional Chrysler 300 themes was placed within the heavily chromed bumper/grille surround. It had a blacked-out insert, against, which was set a cross bar combination with a circular medallion in its center. Hidden headlights were featured again and the parking lamps were tucked in each corner. The rear deck featured a thin, horizontal panel with blacked-out finish, long horizontal tail lamps and 300 lettering at its center. Standard equipment included the following additions or variations from Newport specifications: torqueflite automatic transmission; heavy-duty battery; turn signal indicator lights; power operated concealed headlamps; triple body accent stripes; front and rear foam seat cushions; bench seat with fold-down center arm rest in hardtops; vinyl bucket seats with center cushion arm rest in convertibles and the 350 horsepower 440 cubic inch four-barrel V-8. VEHICLE IDENTIFICATION NUMBERS: The numbering system and code locations were the same as for previous models with the second symbol changed to an 'M' to indicate Chrysler 300. The Code 'K' engine was standard equipment. CHRYSLER 300 SERIES ENGINE See 1968 Chrysler 300 Series engine data.